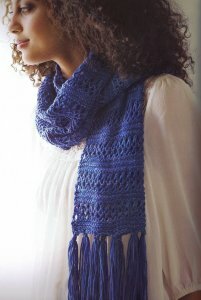 Taken from Wendy Knits Lace: "Worked in stripes of garter stitch alternated with a simple lace pattern, this scarf is a fast, fun knit - and the perfect first project for a beginning knitter - any knitter who wants to try lace for the first time." This pattern is in Wendy Knits Lace, page 41. Size US 8 straights (or size needed to obtain gauge) are required but not included. Finished Measurements: 48" x 10", unblocked (excluding fringe). Gauge: 4 sts over 1". $53.00 -- Kit price including yarn only (no book or pattern).